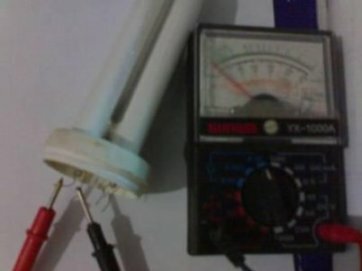 How to re-light a burnt-out CFL bulb ? Don't throw them away ... !!! The burnt out CFL bulbs can be re used. This page will describe exactly how it can be done. This is totally free information. You know the truth about used CFL and Fluorescent bulbs. In fact, Millions of dollars are being wasted each year. Old Fluorescent bulbs and CFL bulbs are discarded everyday as waste. In a way, this is also hazardous for the environment due to the mercury content inside the tubes. But, luckily, though you would wonder, these burnt-out CFL and fluorescent bulbs are still re-usable and can be relight with a simple arrangement. when a CFL bulb is out of order, first of all you have to check whether it can be repaired. To do this, first, carefully disassemble the bulb. Separate the bulb and the ballast. Link :- What is inside a CFL bulb and circuits. There are two pairs of wires coming out of the head of the bulb. Check each pair with a multimeter for continuity. If the continuity is O.K. for both pairs, then actually the bulb is not burnt. The problem is with the balast electronics and it can be repaired. Link :- How to repair a CFL bulb? If the continuity test fails in either side or both, then the bulb is burnt. But don't worry it can be re-light with a small electronic circuit which you can build for yourself. Although the filament inside is burnt, the gas inside the bulb is still there and you can relight that gas. The gas inside the bulb never dies and it will last forever as long as the glass does not break and you can reuse it for the rest of your life. So it is very much worth building this small circuit and replace the ballast electronics with it. Caution ..!!! This includes high voltage. I received some comments on my video that this would get heated and burst. If so it would be terrible. Therefore please do not keep them lighted for a long time with this high voltage.